Miami Trace sophomore Logan Rodgers puts up a shot during a non-conference game against the Unioto Shermans in the Panther Pit Tuesday, Jan. 15, 2019. As the games remaining to be played in the Panther Pit dwindle down to a precious few — in fact if all goes as planned there will just be one more boys game in the Pit — Miami Trace welcomed the squad of Shermans from Unioto High School for a non-conference game Tuesday night. It was a close game until the third quarter when Unioto outscored Miami Trace by 11 points on their way to a 56-40 victory over the Panthers. Unioto (7-6 overall) had a trio of players in double figures, led by sophomore Isaac Little with 15 points. Junior Cade McKee scored 14 points and sophomore Cameron Debord had 12. Miami Trace junior Kyler Conn led his team with 13 points. Junior Trevor Barker scored 11 points and sophomore Logan Rodgers had six points. Rodgers had a game-high seven rebounds. Miami Trace held a 7-6 lead at the end of the first quarter. At halftime, Unioto was in front, 19-17. 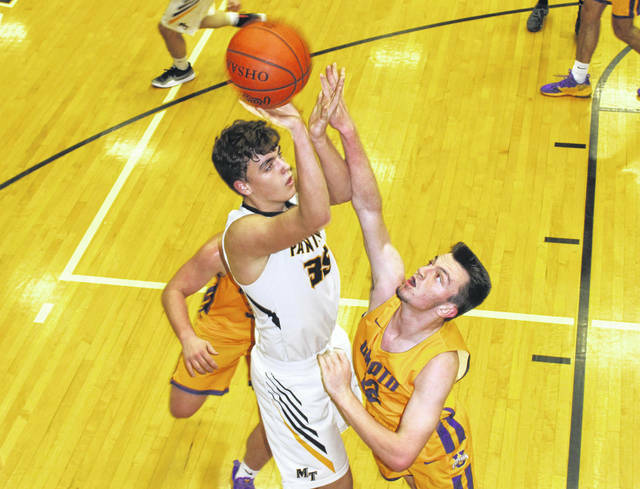 The third quarter marked a turning point as Unioto put 18 points on the board to seven for the Panthers to take a 37-24 lead into the final stanza. “I thought in the game tonight there was an awful lot of physical play,” Miami Trace head coach Rob Pittser said. “That made it very difficult for our kids, at points. We have to coach our kids through that. “We certainly had our chances,” Pittser said. “We came out to start the game and had some chances to get some quick, easy buckets. We missed three or four easy shots there in the first quarter when we could have had a six or an eight-point lead. Miami Trace (1-13 overall) returns to Frontier Athletic Conference play with a game at McClain High School in Greenfield Friday. The freshman game is first, starting at 4:45 p.m. The Panthers will host their final game in the Panther Pit Saturday against Lynchburg-Clay. It will be Military Appreciation Night. All veterans and active service personnel and their spouses will be admitted free of charge. MIAMI TRACE — Kyler Conn 4 (1)-2-13; Trevor Barker 3 (1)-2-11; Logan Rodgers 3-0-6; Austin Brown 2-0-4; Austin Mathews 2-0-4; Dylan Bernard 1-0-2; Cameron Moore 0-0-0; Cody Brightman 0-0-0. TOTALS — 15 (2)-4-40. Free throw shooting: 4 of 8 for 50 percent. Three-point field goals: Conn, Barker. Field goal shooting: 17 of 45 for 37 percent. Three-point field goal shooting: 2 of 10 for 20 percent. Rebounds: 20 (4 offensive). Assists: 4. Steals: 4. Blocks: 1. Turnovers: 14. Personal fouls: 12. Bench points: 2. Second chance points: 4. Points off turnovers: 2. UNIOTO — Isaac Little 5-5-15; Cade McKee 4 (2)-0-14; Cameron Debord 3 (2)-0-12; Chance Smith 2 (1)-0-7; Josh Lambert 2-0-4; Aiden Loeffler 1-0-2; Gunnar Greenwalt 1-0-2; Gabe McBee 0-0-0; Jeremy Lambert 0-0-0; Justin Manson 0-0-0; Carson Debord 0-0-0; Nate Keiser 0-0-0. TOTALS — 18 (5)-5-56. Free throw shooting; 5 of 6 for 83 percent. Three-point field goals: McBee, 2; Cam Debord, 2; Smith. Field goal shooting: 23 of 51 for 45 percent. Three-point field goal shooting: 5 of 18 for 27 percent. Rebounds: 30 (9 offensive). Assists: 12. Steals: 3. Blocks: 1. Turnovers: 10. Personal fouls: 13. Bench points: 8. Second chance points: 4. Points off turnovers: 11.
https://www.recordherald.com/wp-content/uploads/sites/27/2019/01/web1_Logan-Rodgers-vs-Unioto-Jan-15-2019.jpgMiami Trace sophomore Logan Rodgers puts up a shot during a non-conference game against the Unioto Shermans in the Panther Pit Tuesday, Jan. 15, 2019.